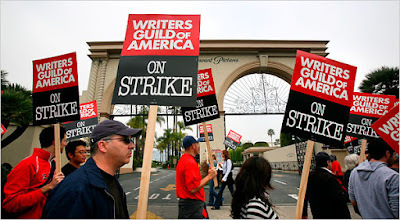 Personally, I don’t care if this writers strike never ends. The longer it goes on, the better I like it. We’re already seeing big dividends: the cancellation of this year’s Golden Globes. Instead of the usual parade of vain and vacant actors and their unusual wardrobes, it’ll be a one-hour press conference Sunday night. Now there’s some compelling television: CSPAN with Botox. I won’t be tuning in, but if you do there’s no need to touch that remote: The press conference will be followed by a rerun of American Gladiators. I like the strike for two reasons. First, it’s useful to occasionally remind Americans that actors don’t think up those wise and witty things they say, that without printed words written by others, they can’t even give each other awards. Second, it is proving what many have longed thought true: It really doesn’t matter what’s on TV; people will watch it anyway. A rerun of American Gladiators? The contempt this shows for the viewing public is breathtaking. But hey: It’s better than kicking the writers a bigger share of “new media” money. Not that I’m in total solidarity with the strikers either. I mean, there’s a good chance that some of them were involved with such series as Knight Rider, Reba or Desperate Housewives. And that kind of thing should not be rewarded. Also, keep in mind that these particular writers are not exactly suffering for their craft. They are all comparatively rich; the dispute is whether they should be even richer. Those who drive BMWs wish to drive Maseratis. This is not exactly Norma Rae we’re talking about. I’d like to see the strike continue through at least February, wrecking the Oscars and perhaps finally achieving some tipping point of public weariness for shows like Dancing With The Stars. or The Bachelor. Probably won’t happen. But a man can dream. Strong, concise, to the point. Who writes your material? Perhaps, and this won’t happen, the American public might start to realize, as you say, that actors don’t make up their own brilliant words. And then maybe said public will stop taking people like Johnny Depp, Sam Waterston and Fred Thompson seriously. Well, I guess they never did take Fred Thompson seriously, but you get the point. Yes, continue like this and people like me might actually start watching TV (on the assumption that if nobody is writing crappy new material and stuffing it with even crappier ads, they will start re-running old classics like The Forsyte Saga and The Pallisers). Strikes of all kinds have a clarifying effect. People realize what they can do without. In the case of new TV shows, it’s not that much of a burden. And if Hollywood’s elite get a little poorer in the process, I’m good with that. The Forsyte Saga! That goes back a ways. Yes, I’ve always wanted to watch it. We did not have a TV when I was a child and it was first shown. (I am 150 years old by the way). Writers are an important part of any entertainment production and it seems that most people may not be aware even if it should be obvious, there is aways talk about the actors but they would be nothing without writers . I agree that the strike will certainly lead to more reality shows which are pretty cheap and easy to produce and often offer nothing more the trash entertainment.